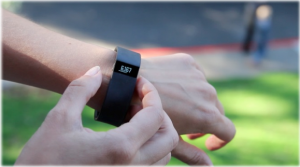 Le Physique | Vancouver Personal Training | Fitness Trackers: Innovative or ostentatious? Fitness Trackers: Innovative or ostentatious? 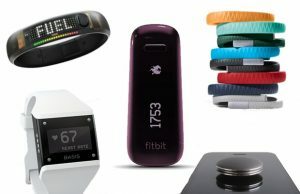 Fitness trackers are definitely the new rage in the fitness industry, and perhaps even on your Christmas list. Devices like the FitBit, Garmin Vivofit, Adidas Fit Smart, or Nike Fuel Band are just some of the fitness trackers on the market. These devices are designed to measure activity, diet, and sleep through its motion sensor as well as your own personal input. With all the new advances in technology, it is easy for us to believe that a new product is a reliable one, but is this always true? Let’s look at the pros and cons of these innovative tools. Most devices are lightweight, comfortable, and not too distracting as daily wear. On the market are typically bracelet-style or worn on the hip like a traditional pedometer. The bracelets are flexible come in a variety of colours, are relatively sturdy, and some brands even offer a version that doubles as a watch. For those that like electronics, most trackers come with a matching app for your smartphone or tablet, which syncs all of your data throughout the day making it easy to check. However, not all devices are compatible with all apps, so if this is an important feature for you, you may want to do a little research on which devices and which apps are talk to each other, before your purchase. You do not have to have your tracker plugged in to view your data, which is another plus. Most apps are fairly user friendly and easy to navigate, designs are clean, organized, and have categories in diet, sleep, and activity. If presentation is important to you, different apps, will display your data differently. For example, not all brands offer graphs of your sleep or steps throughout the day, though they may present this information as lists and percentages. Some devices allow more functions directly from the tracker, whereas others require more app collaboration. The fitness tracker will tell you how many steps you have taken, distance traveled on foot, minutes you were active, and calories burned. Also, if you let it know when you are going to sleep and when you wake up, as well as the quality of your sleep by measuring movement (or lack of) during your sleep phase. How accurate are these results? The more data you enter into your fitness tracker, the more you will get of the device. For example, entering your weight, height, age, diet, and water consumed will give you more accurate results, rather than having the tracker arbitrarily offer data solely based on the activity it sensed. A very important concept to understand is that the bracelet tracking is based on wrist motion. There are some models that are fashioned as more of a clip to be hooked onto a strap or something similar, but the most popular trackers are of the bracelet type. As you can probably imagine, your daily results may be inaccurate depending on how much your wrist moved during activity. If you going on a regular walk using arm swings, the resulting data should be fairly accurate, or at least in the right ball park. However, if you are carrying a bag, walking with your hand on your waist, or otherwise compromising wrist motion, your data could be skewed. Another related con is its ability to track activity that doesn’t require wrist motion, like cycling. Most apps also do not give an option to enter additional activity done that was not felt by the tracker, which would now lead to an inaccurate calorie count for that day. Lastly, your quality of sleep may be inaccurate too, as you may be awake, but your wrist may keep completely still. So now you have a bunch of numbers, or amazing looking graphs, but now what? Interpretation of your data is up to the user. For example, you may reach your step/distance goal for that day, but not your calorie goal, and another day you may surpass your calorie goal but not have reached your steps. Hopefully future trackers and apps could offer tips on how to help the user achieve their goals, even in a generalized sense. 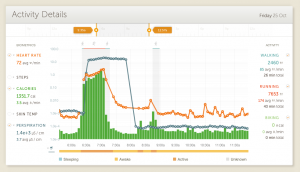 Being able to opt in to friendly reminders such as “try to get and move more often in the day, we see that you have long inactive periods” may be a nice little note, and something that could be pulled from the data your tracker is sensing. A big plus in my opinion is the option the fitness tracker gives in entering a goal. If you are a very goal oriented person, and thrive on reaching your goals, setting one for your tracking can be very motivational. Throughout the day, you can reference your band with a tap or click of a button to see how much progress you have made towards your goal. When you reach your daily goal, most trackers will vibrate or somehow notify you that you have reached your goal, which can be exciting. Also, some of the apps will email you awards, whether it be that you reached 10000 steps that day or that you have been consistently reaching your daily goal. Another great motivational tool the devices offer is that if you have friends with a tracker of the same brand, you can challenge each other, which can bring one some fun, friendly competition. You’ll still need to set some fitness goals and THEN see how the fitness tracker fits into that plan. Buying the tracker (even if it’s only $99) and hoping that it motivates you to move may be a bit like putting the cart before the horse. If you can partner up with someone that will support you towards reaching your goals and help empower you to overcome any stumbling blocks (hey, a trainer or coach is good for this! ), then the tracker can become a more powerful tool towards your success. Keep it simple! Start out with small, simple goals that you can achieve, then add on as they become easier or habit. I’ve known some people to jump on the “10,000 steps a day” challenge with varying results. Some people were highly motivated and others felt discouraged. Your goals and how you use the tracker needs to be customized to your life. In my opinion, these devices should be used more as a motivational tool, rather than to accurately count your fitness progress. Will you turn into a fitness keener with one of these trackers? That’s really up to you. Trackers range as low as $49 and up to $300 per unit, (the high end ones often come with a GPS and heart rate sensors) depending on how technological you want to get. If spending the money on a device gets you moving more or if you are someone who finds themselves sedentary for most of the day, a tool like this may be the perfect little gadget you need to help you get moving and stay motivated. If you are an active individual who has a routine, likes to work out, you may not get as much value out of the same device. Overall, we approve of any tool that supports people to become more active in a way that is fun, safe and heck, also stylish, then all the better. I have been using a fitness tracker news from i have loved it. that some get one thinking that it will fix the inactivity problem others have,Thanks for the post.